Hey guys, I am so sorry about not posting recently. College classes has started for me and I have been very busy with school work and didn't have much free time left for photography and blogging. I happened to have found some time today, so let's get started with the intro to today's photos. For this post, I have some moon photos that I took over a period of one week (I think). I hope you enjoy it. The photos were all taken with my Canon EF 70-300mm f/4-5.6 IS USM Lens. These photos have been cropped. Also, some of the pictures don't seem to be viewing right on my computer via Safari. If this happens with you, just switch browsers and it should show up a lot better. 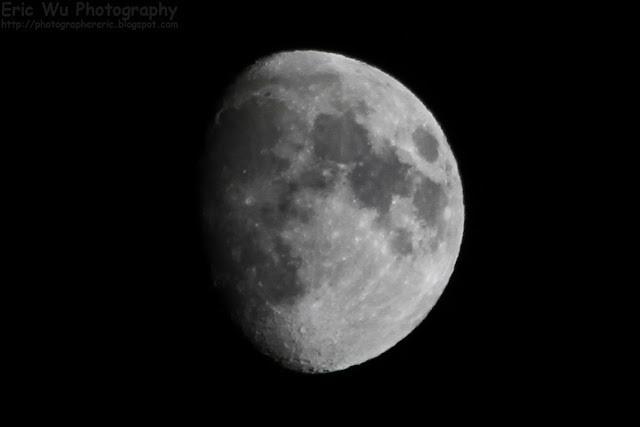 There are some tips on moon photography in today's post, so make sure scroll down for it! For this photo, I exposed for the dark part of the moon that was not lit by the sun, so the part that was lit by the sun is washed out. As you can see there are some motion blur on the photo. 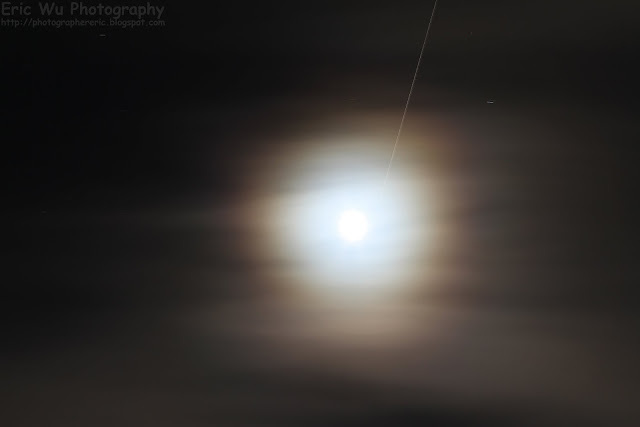 This is not my camera moving, but the actual moon moving. You can also tell there was a star moving too. Same night as the first photo, but at a different exposure time. As you can see the dark area no longer shows up as the exposure was not long enough. 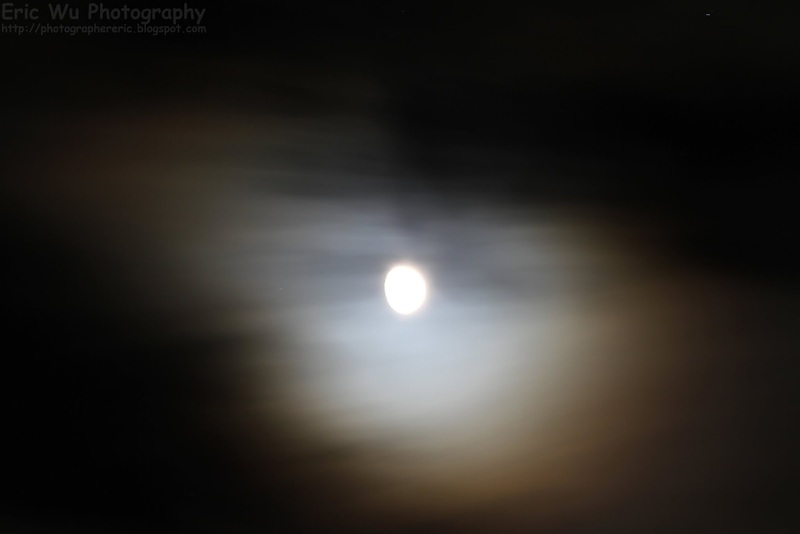 After shortening the exposure, the lit side of the moon's detail is clearly visible. This is a different day from the above photos. As you can see, more of the moon is visible. More of the moon is showing. 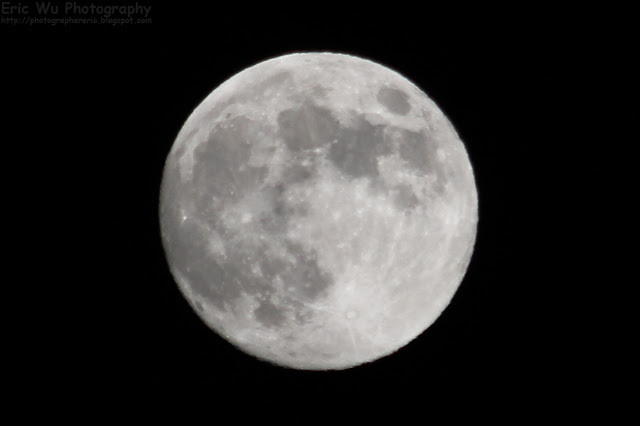 Photography Tip: For photographing the moon, it is recommended you have a good telephoto lens or a telescope. Depending on your zoom, you want to keep your exposure as short as possible and try not to pass 1/100 of a second exposure as the moon would have already moved a great distance during that time and you will get motion blur. If you turn on live view, you can actually see the moon moving! 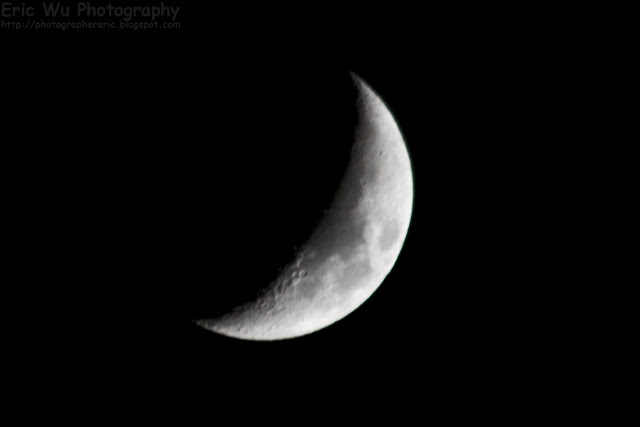 You should also keep your aperture wide as the moon is very far away so you are getting quite a lot of depth of field at a wide aperture. Generally the camera will have a hard time getting the right white balance for these kind of photos, so take your photo in RAW. 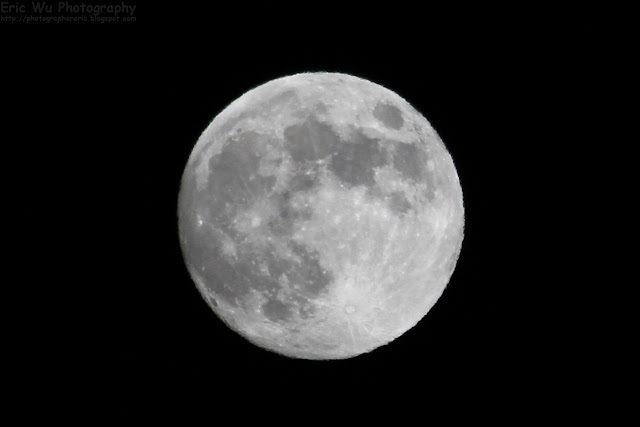 In Photoshop, I'd usually tweak the white balance a little bit, turn up the contrast, and then crop out the large black area around the moon. 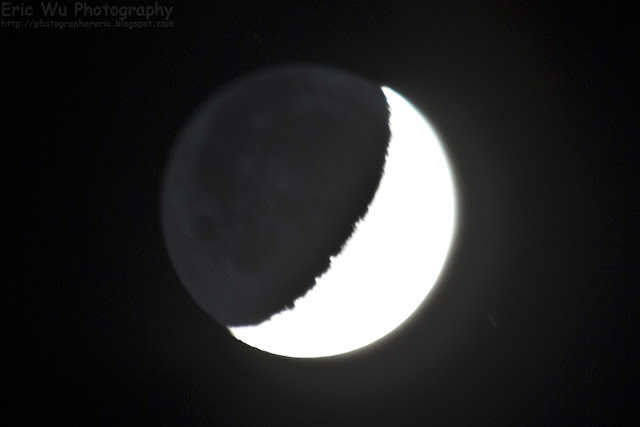 Photos right out of your camera of the moon will usually not have enough contrast. 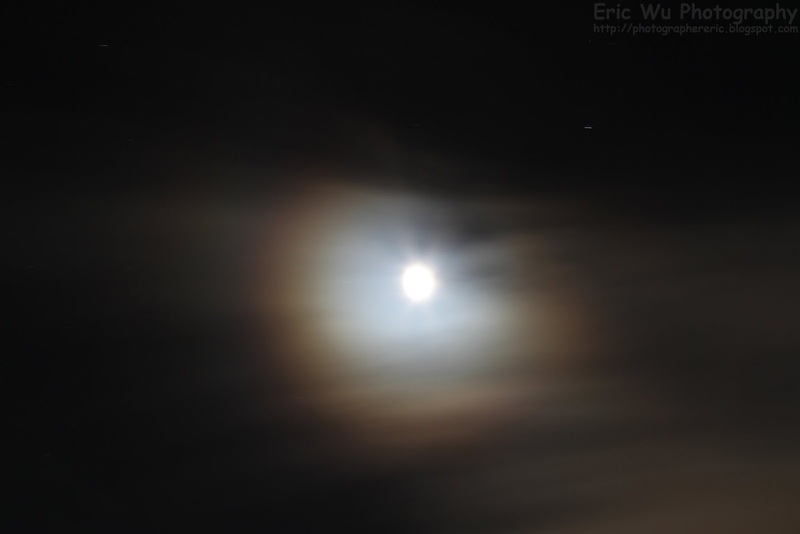 Shortly after I took the above photos, some clouds came in and blocked out the view of the moon. 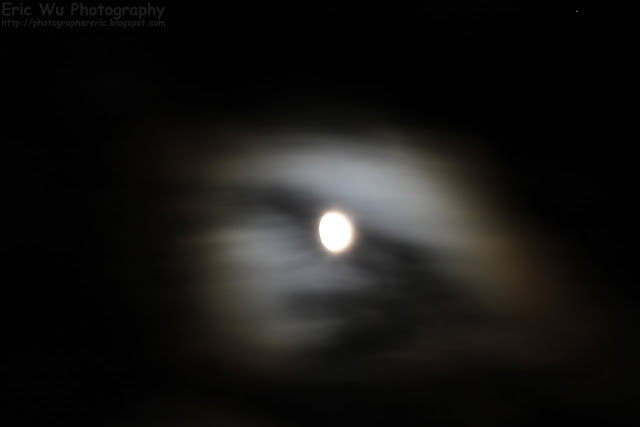 I thought it would be nice to see what it would look like if I did a long exposure of the clouds moving between the path of my camera and the moon. This is the result. A even longer exposure than the one before. A even longer exposure than the one before. I can tell both by my meta data in the image and how far the star streaked in the photo. Looks like an airplane or a satellite flew through as I was taking the photo. Another photo of the full moon. 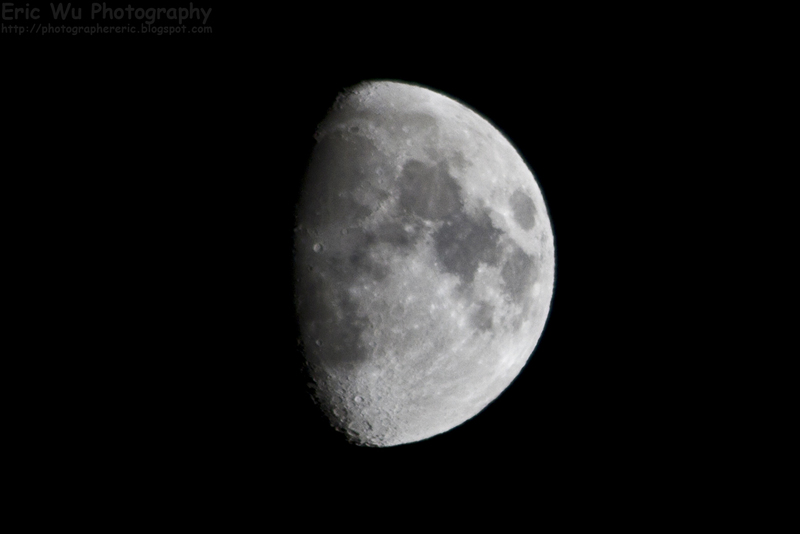 I hope you have enjoyed these moon photos. I would appreciate it if you leave me some positive comments below! Please don't forget to share my blog posts with your friends! If you would like to get notifications next time I post, you can "Like" me on Facebook or follow me on Twitter and Google+. These links can also be found on the top of the right sidebar.